It looks like my hopes that Barnes & Noble's UK retail partners would start selling the Nook Glow last week was a tad optimistic; B&N's UK launch has been officially delayed by 2 weeks. The Bookseller is reporting today that B&N's retail partners won't be selling the hardware just yet. According to sources it was B&N who informed retailers today of the postponement, though no details have been released as to why. The several websites I checked show an out of stock note in place of the buy buttons, with no other explanation given. 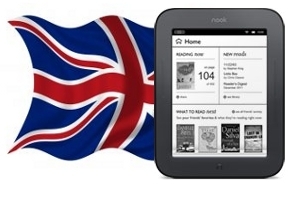 The Nook UK launch had originally been planned for the fifteenth, but thanks to this delay UK reades will be able to buy the Kindle Paperwhite before they can buy the Nook. B&N is also going to have egg on their face because their ex-fiance Waterstones will also have the Kindle in store before the Nook will be available. If I remember correctly, the Paperwhite will only be in the US in 2012. The Paperwhite is not going to make it to the UK or anywhere outside America until sometime in 2013. Amazon announced yesterday that the KPW will be in the UK and Europe at the same time as the Kindle Fire HD. I’m disgusted by their lack of explanation and/or apology. I’m only waiting until the 29th Oct (the supposed rescheduled launch) date because I happen to know how to ‘Root’ the Nook, effectively turning it into a Tablet/eReader which, I intend to do as soon as it finally arrives. If there’s another delay i’m just going to get my money back and get a Kindle. I recommend everyone else do the same! There’s no good reason for the delay, they’ve only done it because their online shop (their main reason for creating and selling the Nook) isn’t up and running yet. Given that the Nook only allows access to Barnes and Noble’s online shop (hence the need to ‘Root’ it), it’s obvious that the delay is a desperate(ly greedy) measure to discourage us early buyers from getting refunds and buying a more user-friendly eReader. Barnes and Noble have a reputation for being greedy; seems it’s well deserved! – Kindle DRM ebooks are tied to the hardware of the ereader. No sharing possible without access to Kindle account (and downloading a specific copy). – Supports B&N and Adobe DRM. You can buy DRM ebooks from any ePub bookstore, except Apple. – B&N social DRM. No technical limitations sharing an ebook. Easy sharing with family and friend by just copying the ebook. Which is the most flexible, least restrictive ereader out there? Kindle DRM ebooks are *not* tied to the hardware. You don’t even need Kindle hardware to buy Kindle books. The PC, MAC, or phone apps will suffice. What I meant to say is that the Kindle DRM ties the ebook to the specific hardware device you download it for. If you copy a Kindle ebook file to another device you will not be able to read it. With every device you will have login to your Kindle account and download a copy tied by the DRM to that specific device. B&N’s social DRM has no such technical limitations. You can take any B&N ebook file and just copy it to as many devices as you want, as many times as you want. And you will be able read it on all of those devices.